Upper Deck released its popular SP Game-Used product last week, and I was able to get a box then. Due to a pretty hectic schedule, I wasn't able to get this review out until now... sorry! But I'm glad to have it ready for you to read at this point! Long time collectors know that SP Game-Used is a product that underwent some major changes last year. This year's release continues on what Upper Deck did with the venerable brand in 2012. Let's take a look at what SPGU has to offer us this time around. I've mentioned this before some time ago, but the SP Game-Used base cards and cards of the SP-line are generally unremarkable. They certainly aren't bad looking cards, in fact, I think the base cards this year are pretty sharp looking. But their similarity to each other year after year make them hard to distinguish. You almost always get the player image on a white background with some graphics. It is what it is. The base cards are clean and modern, but ask me in a few years what season these came from... and I might have a hard time telling you! The back of the base card is standard Upper Deck fare. And that's a good thing, because Upper Deck usually doesn't stick to just one or two tones for the back. The entire back of the card has different graphical elements in a variety of different colors and shadings. Upper Deck produces the best card backs of them all. Though I do enjoy the SPGU card backs, they aren't the most radical design I have ever seen. Like the fronts, I do like the back, but they probably won't be stuck in my memory for too long. Like Titanium from Panini that was just released, SPGU has gone the route of making their rookie cards numbered to the players jersey. While it makes the card more collectible... it makes actually pulling one much harder. I wasn't able to pull one in my box, but a quick scan of eBay reveals what they look like. Each card has a special rookie design that is different than the base. The cards feature a script looking serial numbering on the upper right corner. You'll also see that people are asking quite the high price for these rookies! Boxes of SP Game-Used are pretty small. I remember when I got back into collecting and bought one. I though... how could such a small box cost so much!?!? It almost seems silly picking packs out of the box as there are only five of them in there. Each pack of SPGU will offer up a hit though - collectors will find jersey cards, patches, sticks, gloves, autographs, and more. The Authentic Fabrics jersey card is the most standard memorabilia card you can find in SPGU. Usually, if you get one of these in your packs, you'll be disappointed. Packs of SPGU range from $20-30... and getting a plain jersey card is not what it once was... even for star players. The jersey swatch on these cards is medium sized. The design of the card is a bit mundane though. They look like something that would have come out a few years back. Somehow UD dropped the ball on the look of these cards. The Authentic Fabric cards also come in dual swatch variations as well. 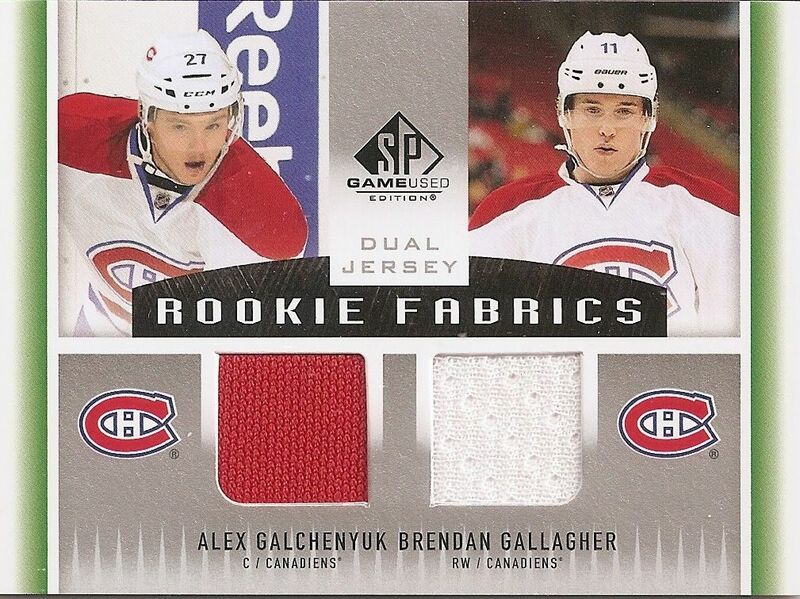 The Galchenyuk/Gallagher card shown above is an example of one with two pieces of fabric. Unfortunately, the memorabilia pieces are much smaller here. These dual card share a similar design with their single counterparts. And while I always like continuity in design, it's too bad I didn't enjoy the look of the regular single memorabilia card to start. A saving grace with this card type could be a potentially nice patch parallel version of these cards. Of course that is relying on the memorabilia pieces to overcome the design weakness. The base cards and rookie cards come in autographed parallel versions. 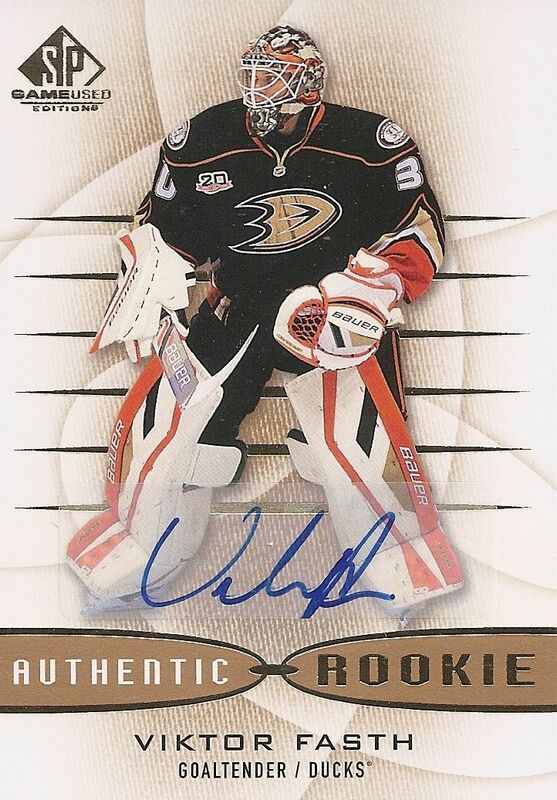 I was able to pull an autograph of rookie Viktor Fasth of the Ducks. These autograph cards are not numbered and simply have a sticker slapped onto the front of the card. I'm not a fan of cards having autographed stickers just willy nilly on the front of a card. These are fine cards, but I wish Upper Deck had put more thought into them. I guess the good thing is that now I have an image of what a rookie card out of SPGU looks like! Just imagine this card without the sticker auto and a serial number to 30. That's what the Viktor Fasth true SPGU rookie would be like. It would also be worth a lot more than this autographed version! My other autographed card was of number one draft pick Nail Yakupov. I'm not showing it because the card is a redemption. My box didn't yield any crazy huge patches or unique memorabilia pieces (like net cords), but they are out there for collectors to find and pull out of boxes. Manufactured autographed letter patches can also be found in this year's product. 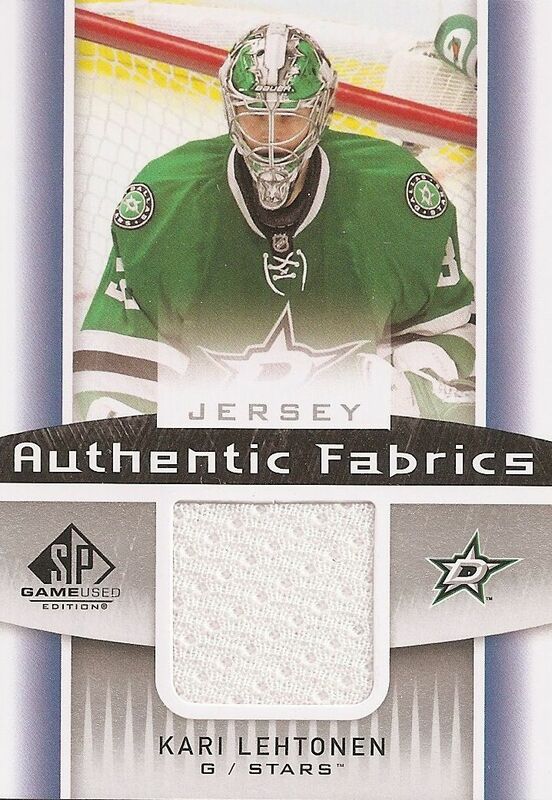 Though why would you put manufactured fabric cards in a product call GAME-USED? In fact... all the rookie memorabilia is EVENT USED too. All I have to say to that is ... sigh. SP Game-Used is a hugely hit or miss product. This year and last the price dropped, so buying it doesn't seem like such a hard pill to swallow if the box is a miss. I mean... the box price dropped about $70 or so! That's a pretty big drop! Though buying boxes of SPGU has become more affordable, it's still pricier than the standard $100 box price for mid-level products. The incentive for SPGU is that you get a hit in every pack... but too many packs contain just the boring Authentic Fabrics jersey card. If you're going to buy SPGU, I would recommend buying by the box only. That way at least you get something autographed. Lucky collectors may pull some very unique items, though, and that's always a big draw. I think my box would have been better if I had gotten it in another year. The Nail Yakupov Inked Sweater I pulled was decent... but getting an autographed card of a number one pick is usually more exciting. All-in-all, I think SPGU is a decent product for its newer lower price point. I know that collectors still hate the fact that there are probably too many jersey cards in it, but the lure of great memorabilia and low numbered rookie cards can be a draw to buy this product. I love the looks of this product again this year! It has such a clean look! Thanks for the contest! I honestly deteste the design around the gameused it looks cheesy. This box is really hit or miss. If you pull something decent, then its worth it, if not, forget it. Not something I would buy, I would opt for Titanium instead! I like that Viktor Fasth card it's really nice. I've always been a big fan of SP Game Used Autographs and base, but I've never liked the jerseys. It's definitely a hit or miss product. Some people get worthless hits and others will get twice the price of the box. The Yakupov wass a nice pull, though. Really love SPGU, every box has I would have to say a guaranteed nice hit of some sort. But one thing I would love to be changed is to number more cards because I feel that puts the value up and less are massively printed. I must say I am a fan, I like the look of the base a lot ! That Fasth card was definitely missing a shortprint. The Yakupov card may have saved the box. The box would be a waste if it wasn't for the yakuov. Still I don't think it's worth it unless you hit something bigger. Good review! SPGU looks good this year, and I love the base card design. I would give this product a 8/10, as it is lacking the nice look to the authentic fabrics. Those authentic fabric cards looks so cheesy, that was cool 10 years ago. I have to pass on this set and try an SPx box in a few weeks instead. Surprised about the Yak redemption, thought that would be an available card. I like the design of the base cards and love the Habs rookie sweater card! Wish they'd just stick with 6 packs. Great review. 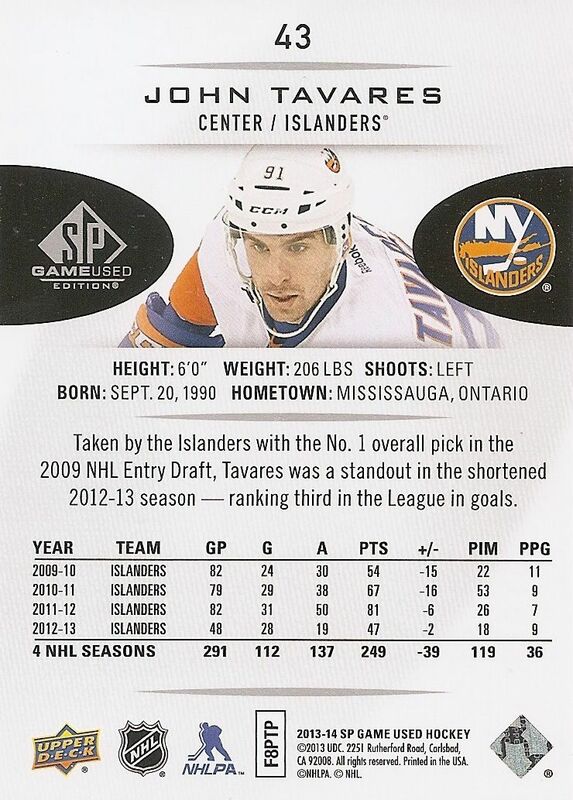 I think the look of the Viktor Fasth card is amazing. The Gallagher and Galchenyuk jersey was cool too. sp game used to me is a lot like Titanium, 5 packs, usually 2-3 packs have the basic jersey card, it really depends on what else you get in the box, the yakupov and fasth were very nice! I like the base design and the addition of rookie jerseys. It adds a new aspect to an UpperDeck staple brand. I love the clean look to the base cards and that you get a decent amount of legends! Another one to give a miss. The only release of SP Game Used that really caught my eye design wise was 09-10. This design looks like they re-used the templates from 10-11. Really lazy work. 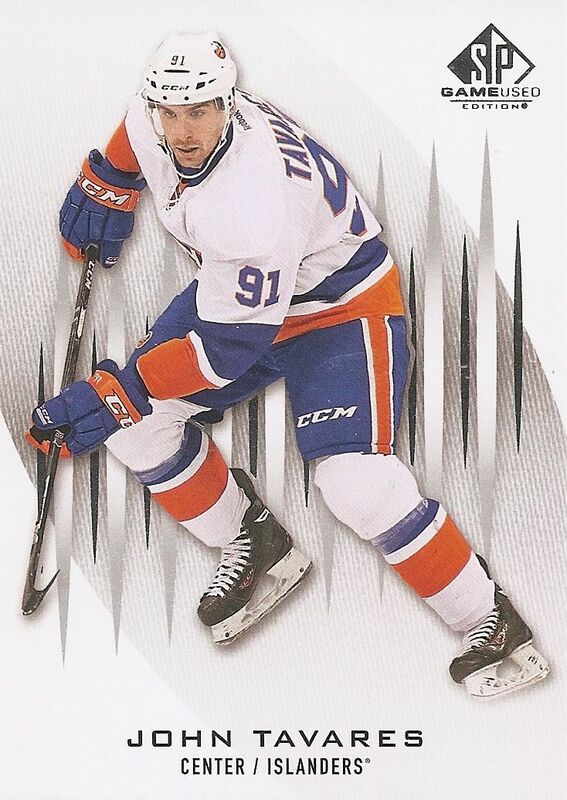 + The 12-13 SP Authentic designed rookie cards actually look pretty nice. But of course it would've been better with on card autos. + The fact that you can pull some sick cards out of the product makes it a bit more exciting. - A product which name is SP Game Used should only have game used stuff in it. - The Authentic Fabric cards have been worse for every year now. I actually liked the 11-12 design, but this years remembers me of some UD Series 1 jersey.. That's bad! - It is really a hit or miss product, and for the price I have seen many more "miss"-boxes than boxes which value actually are close to the box price. Nice break! Wonderful cards! Love the Vasth autograph! Hope you get more soon! Nic break! Keep it up! I would only buy cards of this on the secondary market. I'm not wasting my money. Not worth the "rush" feeling. Maybe if cards in Canada cost the same as they do in the US, I'd consider it... Or if it had 2 auto's per box instead of 1. Jersey cards are so cheap to make, they sell for $2-3. not bad! i always have liked SPGU! ITS ONE OF THOSE HIT OR MISS! i honestly believe that they could have done a bit better on the design and i like the look of the cards from previous years better. Its feels like the downfall of MVP again. Not worth buying.